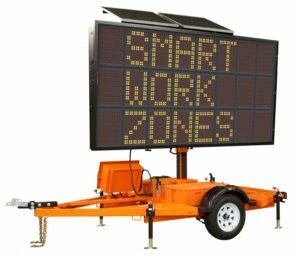 Smart Work Zones - RoadSafe Traffic Systems, Inc.
AQW (Automated Queue Warning): Based on real-time traffic data, Queue Detection and Warning Systems automatically inform travelers of the presence of downstream stop-and-go traffic with the use of message signs positioned upstream. The benefit is that motorists can anticipate the upcoming situation and the result is reduced rear-end collisions. Successful applications have seen a reduction of up to 70% in rear-end collisions. Portable AQW – Utilizing portable sensors like the Speed Mac, sensors can be set up and removed quickly to provide queue warnings for daily lane closures or nighttime paving operations. With an algorithm preprogramed into the software, the system will instantly begin automating Queue Warning messages to message signs upstream. The benefit is that motorists are informed of non-recurring congestion and the result is reduced rear-end collisions. Variable Speed Limit – Based on real-time traffic data, Variable Speed Limit systems automatically inform motorists of lower speed limits needed upstream due to slowing traffic or congestion. The variable speeds are displayed on Variable Speed Limit trailers or Full Matrix RGB color portable message signs. The benefit is vehicle speeds are lowered before the slow/congestion area improving safety and mobility. Work Zone Speed Limit – Portable work zone speed limit trailers are designed to display work zone speeds when workers are present and posted speed limits when workers are not working or present. The benefit is increased safety for workers and the motoring public in work zones and improved mobility during non-working conditions. Additionally, portable sensors can be added to these trailers and can be used in conjunction with AQW and travel time applications. Speed Awareness – Speed awareness devices display the current speed of the motorist along with the posted speed. Feedback messages can be displayed when the motorist exceeds the posted speed limit. The benefit of this system is that it slows down motorists at specific locations to improve safety on the roadway. Additionally, these trailers can be used in conjunction with AQW and travel time applications. Dynamic Lane Merge (a.k.a Zipper merge) – Utilizing portable sensors before a lane reduction, the system analyzes speed and occupancy of each lane before the merge. Based on the traffic flow data, the system will provide real-time lane information to motorists upstream to even the flow of traffic thru the merge. The benefit is improved mobility thru the lane reduction merge and reduced incidents. Over-height Vehicle – Utilizing over-height detection sensors, the system automatically alerts drivers in advance of an alternate route or to stop if they have passed the route. The benefit is preventing collisions to structures that cause significant damage and delays. Hazardous Roadway/Weather Conditions – Utilizing a variety of weather and roadway sensing devices, these systems dynamically caution motorists about dangerous or unexpected roadway conditions. 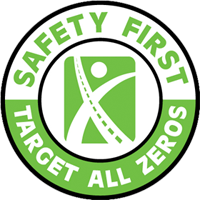 The benefit is the system provides the motorist with real-time potentially life-threatening conditions and instructions to safely travel.